Address of the main gatehouse at River Place. Open in Google Maps. ​River Place is a gated community of four 10-to-12 story buildings sited on the banks of the Potomac River near the Key Bridge and historic Georgetown. 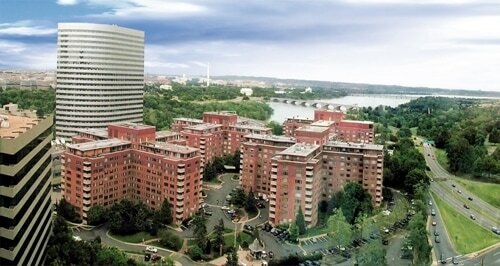 It is one of the most convenient locations in the Washington DC metro area. ​The Rosslyn Metro rail station is only one block from the apartment complex and is part of one of the best subway systems in the country. You may ride the train to anywhere in the Washington D.C. Metro area and rest assured that it is the most convenient and affordable means of transportation. ​The neighborhood is upscale and very safe. A number of residents walk to work in the area. Most students walk to Georgetown University across the Key Bridge or take the University shuttle bus. Supermarkets, restaurants, bars, fast food restaurants and most conveniences are at a walking distance. A few ideas to enjoy.. Walk one block to the Rosslyn Metro/subway station. Walk to the famous Georgetown or Georgetown University. Ride Metro to the next stop to George Washington University. Walk to the Key Bridge. Walk to the Iwo Jima Memorial or Freedom Park next door. Walk to Roosevelt Island and the Potomac River. Walk to restaurants & bars. Walk to the super market & shopping centers. Ride to all free museums and the White House in Washington D.C.
Watch the Capitol City 4th of July fireworks from the grounds. North on US 1 (Jefferson Davis Hwy) onto Rt 110 past Pentagon to Rosslyn/Wilson Blvd. Left onto Ft Myer Dr. One block to left onto Fairfax Dr. Cross Lynn St to River Place entrance. Take the exit for Washington (Stay on this Dulles Access Road towards Washington). DO NOT take any exit for the next 20 or so miles. Look for exit 73 for Rosslyn/Key Bridge and take it. This exit will put you on Lee Highway. Drive about a mile to right turn on Ft Myer Drive. (Stay in the middle lane) Drive about 3 blocks, take a left turn on Fairfax Drive. River Place will be in front of you at the intersection of North Lynn and Fairfax Drive. Cross Roosevelt Bridge into Virginia, take Rt 50 West. Take Rosslyn exit to right on N Lynn St to right on Fairfax Dr into River Place entrance. Cross the Key Bridge into Virginia (straight past the Marriott) onto Ft Myer Dr. Take the left lane under underpass. Turn left at light onto Fairfax Drive and drive straight into River Place entrance.